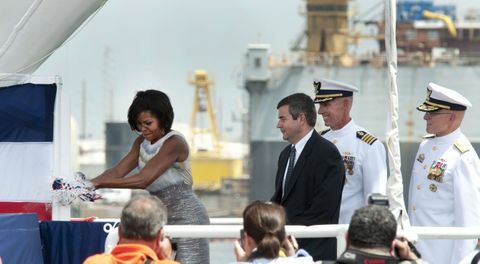 PASCAGOULA, Miss., July 23, 2010 -- First Lady Michelle Obama christened the Northrop Grumman-built (NYSE:NOC) U.S. National Security Cutter Stratton (WMSL 752) in front of 3,000 guests today calling the ship "truly magnificent." "Here in Pascagoula, you've been building ships for centuries," said Mrs. Obama. "It's in your blood—a proud tradition passed from generation to generation. Your hands have given us some of the greatest ships in the United States Navy and Coast Guard. So whether you're a welder or a fitter or a burner—whatever your craft—today is also a tribute to you and your families, and America thanks you." Stratton is named in honor of Captain Dorothy C. Stratton (1899-2006), the U.S. Coast Guard's first female commissioned officer and director of the SPARS ("Semper Paratus - Always Ready"), the U.S. Coast Guard Women's Reserve during World War II . SPARS mainly replaced men in shore stations during most of the war; however as the war progressed SPARS were placed in charge of greater areas of previously male-only control—including as parachute riggers, aviation machinists' mates and air control tower operators. Several former SPARS attended the ceremony. In his ceremony remarks, Northrop Grumman Shipbuilding president Mike Petters recognized all of the shipbuilders who are building Stratton and added, "Captain Stratton was truly a trailblazer – and I know that her passion and energy will be embodied in this great ship named for her, built by the best shipbuilders in the world." U.S. Coast Guard Capt. Bruce Baffer is the ship's prospective commanding officer and will lead a crew of 120 U.S. Coast Guard sailors. "Christening of Stratton is an important step in advancing our Coast Guard mission," said Admiral Robert Papp, Commandant of the U.S. Coast Guard. The Legend -class National Security Cutter (NSC) is capable of meeting all maritime security mission needs. Powered by a twin propeller combined diesel and gas turbine power propulsion plant, the NSC is designed to travel at 28 knots maximum speed. The cutter includes an aft launch and recovery area for two rigid hull inflatable boats, and a flight deck to accommodate a range of manned and unmanned rotary wing aircrafts. It is the largest and most technologically advanced class of cutter in the U.S. Coast Guard, with robust capabilities for maritime homeland security, law enforcement, marine safety, environmental protection and national defense missions. This class of cutters plays an important role enhancing the Coast Guard's operational readiness, capacity, and effectiveness at a time when the demand for their services has never been greater. "Cutter Stratton... embodies our drive to constantly innovate and evolve our maritime capabilities and leverage technology to our greatest advantage. It also reflects our desire to create a more modern, agile and forward-leaning Coast Guard capable of handling a new era of national security threats," said Janet Napolitano, Secretary of the Department of Homeland Security . Northrop Grumman Shipbuilding is responsible for the construction and testing of the NSC's hull, mechanical, and electrical systems, while Lockheed Martin is building and integrating the command, control, communications, computers, intelligence, surveillance, and reconnaissance (C4ISR) capabilities onboard the cutters.